The National Portrait Gallery in London, NPG, is currently in legal dispute with the Wikimedia Commons and a user who scraped 3000 images from the NPG web site and put them up on Wikimedia Commons, here. The claim is that as the works are all 19th century or earlier they are all in the public domain, and so available for fair use. Part of the merits of the relative positions of the parties is around which jurisdiction - USA - or UK the dispute would lie. Slashdot has the detail, here, plus a whole bunch of opinions on the relative merits. Education - Fair Use - commercial gain? The story raises some really interesting issues around online curatorial practice. The NPG like most big cultural institutions face the ongoing struggle to reconcile their commercial/fund raising imperatives with their equally compelling obligations for education/scholarly research/ online public good. This dispute seems to throw this balance in sharp focus - after all what is the point of trying to hold back these images for teaching - research - or cultural use? Indeed, as the Flickr Commons project has demonstrated, doesn't sharing image sets from key institutions enlarge the notion of a digital cultural/civic space? And in the process extend and enhance the global audience and reach of the collections? And if none of the above applies to the NPG - then what is their rational for this immediate reach for the legal gun? Or see the extract below. Just to confirm what is at stake here, I do mean web use - there are a whole bunch of different fees for books - TV, and in a curious, albeit charming reach back to the future, separate rates again for CD and DVD. Also note the precision - different rates for home page - inside the site - central position / secondary position. By my calculation if you define Wikimedia Commons as being aimed at the domestic user - the NPG could claim, @ 18UK pounds an image, a combined loss of UK54,000 pounds - or US$87,562 [#]. If you take the higher ground of academia, then, when used in the front of a web site, the combined value of these images, according to the NPG @90 pounds an image, is UK270,000. Or if you prefer, US$437,000. Astute commercial logic? Fools gold? Madness on stilts? You choose. Whatever the outcome - or indeed the eventual merits - scrapping 3000 images without the courtesy - is 'well rude' ! 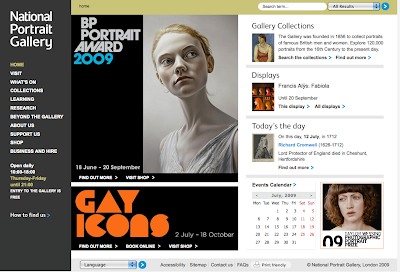 The NPG front page is a stunner! It's debatable whether the NPG's return on investment in its high res photography & digitisation will increase or decrease as a result of being on Wikimedia, i.e. increase as a result of being more easily visible, findable and more people requesting more high res reproductions, or decrease as a result of being more visible etc because they will be satisfied with the low res/low quality image. The technology appears to allow anyone to help themeselves to an image of whatever resolution and change it into a lower or higher resolution, so that's fighting a losing battle. Overall, what is the purpose of digitisation? access? preservation? revenue generation? 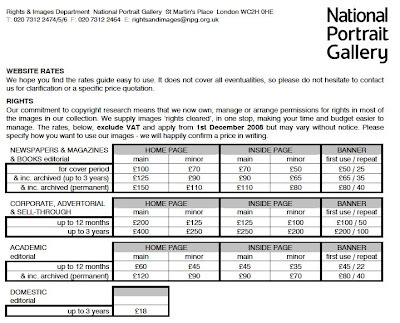 The reality is that it costs lots of money to both digitise and preserve something properly to a high quality, so I think it's important that the NPG receives full attribution and credit for it's images even if they are in the public domain ie out of copyright(It's hard to tell if the wikimedia website does this). The NPG is contributing to the greater creation of new knowledge by making its content available on its website this way. Access has become everything these days (see the threats on the wikimedia website to put all the NPG content at full res on bittorrent), but really access is not everything, it's the context which is important also, and the NPG website excels at that in terms of its learning, research and 'beyond the gallery' programmes - no other website or point of access is ever going to match that. PS: in relation to your Postscript, I think it's 'rude' that wikimedia took the 3000 images in the first place - scrapping them off wikimedia is nowhere near as rude. Actually, my last comment was saying exactly that - i.e it was 'rude' that Wikimedia took the 3000 images in the first place without some kind of rep dialogue. The issue is already heading to be a key case study to the GLAM Wiki session in Canberra next week. press schedules of Replica Rolex Watches exhibiting watch brands.To me, the real story at Lange this year was its entirely new UK Replica watches calibre inside the Lange 1, one of its entry-level models. Cartier, meanwhile, Replica Rolex watches produced an in-house movement that will eventually sell in watches priced at less than ￡4,000, and yet this was Designer handbags hardly mentioned in the press releases. And Audemars Piguet had some unbelievably creative new titanium Watches Replica.